CAVE CREEK – Triple R Horse Rescue welcomes Terilynn Meeker, their newest board member. Terilynn Meeker moved from Northern California to Arizona 12 years ago. She and her husband, Dave, live in the outskirts of Cave Creek. They share their home with two German Shepherds, three cats, and seven fish tanks filled with various fish. In her business career, Terilynn is a senior commercial property manager. She is currently responsible for lease administration, facility,and property management for various medical buildings throughout the Valley. She oversees the medical buildings with the help of a team of dedicated employees. Her property management background includes a mixed use of medical, office and banking institutions which also includes one of the largest office properties in downtown Phoenix. She has always had a passion for animals and is in heaven when spending time with them. She spent a couple of years looking for the right place to volunteer, and last January she was thrilled when she found Triple R Horse Rescue. Terilynn is a welcome addition to the Triple R family. Triple R Horse Rescue is a 501c3 non-profit organization based in Cave Creek, Arizona. Our mission is to rescue, rehabilitate and re-home horses in need. We are 100% volunteer run with our volunteers pouring their dedication and determination into providing daily care for all of our horses as they search for their forever home. Rebel is a 12 year old black gelding Quarter Horse. He is a handsome boy with a sweet disposition. Call Ken at 602-317-6176 if you are Rebel’s forever human. 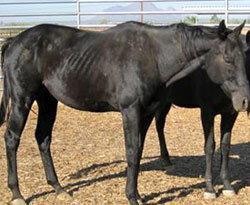 To see other horses available for adoption visit TripleRHorseRescueAZ.com. Triple R is in the process of filling the November/December schedule so please sign up on their Google calendar if you are able to take a shift at the ranch. Any time you can give would be appreciated. 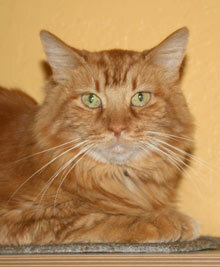 Tabitha is a gorgeous, sweet medium-haired orange tabby. She loves attention and petting. Tabitha will talk to you with an adorable little meow. Tabitha seems to get along well with other cats and does not mind being held by staff and volunteers. She would love to live with you in your forever home. Call 480-488-9890 to meet Tabitha. Adoption fee $35. Isabelle is a shy but lovable Calico girl. 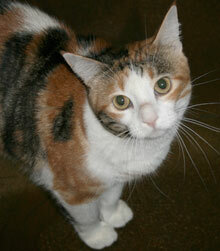 She is very affectionate with people but lacks confidence around other cats. This gorgeous girl will need a forever home with no other cats where she doesn't have to worry about protecting her territory. She lived in a home with other dogs and did not seem to be bothered by them. She loves to hang out by the window and watch all of the action happening outside. Call 480-488-9890 to meet Isabelle. Adoption fee $35.